Is this curtains for the bull market? The markets plunged for a second straight session Thursday, as investors continued to worry about rising interest rates, the U.S.-China trade war, and nascent inflation. The bloodbath was widespread. The Dow Jones Industrial Average, S&P 500, technology-heavy Nasdaq, and small-cap Russell 2000 all closed in the red. Asian markets swooned as well. The CBOE Volatility Index (VIX) spiked 10.06% and now stands at its highest level since February. At its session low, the Dow was down 699 points. All 11 S&P sectors finished lower, with energy, real estate and financial services lagging the worst. The Nasdaq and Russell 2000 dipped into correction territory. The fear is that corporate profits won’t hold up to mounting headwinds. According to the research firm FactSet, the S&P 500 is expected to report year-over-year earnings growth in the third quarter of 19.2%. However, earnings have been “juiced” by the $1.5 trillion tax cut package signed by Trump in December. Economists are cautioning that the benefits of tax cuts already are waning amid rising economic and geopolitical risks, as well as a surging federal deficit. Those tax cuts also are stoking inflation. Economic data today was mixed. 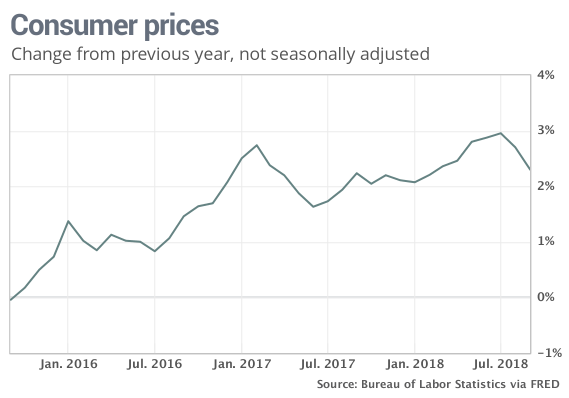 The government reported Thursday that U.S. consumer prices increased less than expected last month, due to moderating rent increases and slumping energy prices. But the overall trend remains inflationary. Excluding the volatile food and energy components, the so-called “core” CPI edged up 0.1% for the second straight month, after increasing 0.2% in May, June and July. In the 12 months through September, the core CPI increased 2.2%. Economists had expected both overall and core CPI to climb 0.2% last month. About half of the rise in the CPI in September was linked to the cost of home ownership and higher rents. The Federal Reserve prefers a different inflation measure, the personal consumption expenditures (PCE) price index excluding food and energy. The core PCE price index rose 2.0% in the 12 months through August, holding steady at the Fed’s 2% target for the fourth consecutive month. A separate Labor Department report today showed an unexpected rise in the number of Americans filing for unemployment benefits last week. Initial claims for state unemployment benefits increased 7,000 to a seasonally adjusted 214,000 for the week ended October 6, near a 49-year low. The upshot: Inflation has slightly cooled but still poses a threat. The job market remains robust, adding inflationary pressures to the economy. Add all of these reports together, and they do nothing to change expectations that the Federal Reserve will raise interest rates in December and several times again in 2019. History shows that rising rates tend to kill bull markets. For his part, President Trump is not happy with rising interest rates. Departing again from long-standing tradition whereby the president doesn’t meddle with the Fed, Trump excoriated the central bank yesterday and today. Trump’s barrage of criticism is unlikely to change the intentions of Fed Chair Jerome Powell, who has vowed to be less accommodating on rates. When the adverse effects of rising interest rates, tariffs and inflation all converge, conditions for investors are likely to get “loco” indeed. Stay cautious. More carnage probably lies ahead. Ethanol producer to sell three ethanol plants. Energy producer enters deepwater venture with Petrobras (NYSE: PBR.A). Apparel retailer posts strong sales growth. Financial advisory service disappoints on earnings. Engineering giant posts weak interim Q3 results. Wall Street looks askance at biotech’s common stock offering. “Do you see a geopolitical risk that also poses a major investment opportunity?” — Thomas J.
Trump’s “America First” policy is causing the U.S. to retreat from international agreements. China is rushing into the leadership vacuum, which makes China’s neighbors in Asia nervous. Some of China’s neighbors are age-old antagonists; they never trusted the Middle Kingdom to begin with. 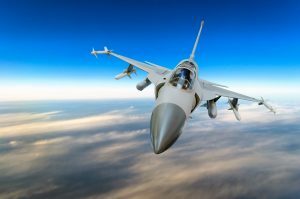 This overseas trend is a boon for aerospace/defense, which already enjoys robust demand from the Pentagon. High-margin jet fighters are popular export products and U.S. aerospace firms will sell more of them in coming months.